It was ironic after meeting Polly Higgins in Belfast a few weeks ago, that when I travelled home the next day I witnessed one of the most devastating storms this winter to hit Ireland (Storm Darwin). Many local people have not remembered such strong winds before. It took me 7hrs to get home as there were trees down all along on the train-line from Dublin and the wind was so strong it rocked the train while we waited. I was worried for Hollywood too as we heard, via announcements on the the train, that many trees were down in Kilkenny (Kilkenny council issued a state of emergency that evening) and my nearby village was ‘closed’ for several days as 17 big trees brought down power-lines on the main street. We’ve all been talking about this storm since. Many of us in our local area had no power for 3-5 days and many trees in the area were lost. Checking in on one of my friends the next day I found her with a handsaw trying to deal with three large trees down on her driveway! do get more resilient. So perhaps this is why we didn’t lose many this time. Sadly mature beech and Scots pine, just down the road were snapped like matchsticks. I’ve never heard so many people talking about trees. Tree losses around the country, especially in commercial conifer plantations losses were heavy. Estimates in from across the country this week now say 7.5 million trees fell in this storm!! Yet in between all the storms we have had the occasional nice day. One sunny afternoon I went to visit my friend Nicola and her partner Alan. Nicola is an extraordinary successful international felt-maker, teacher and blogger who has also planted around 8 acres of her land with mostly deciduous broadleaf trees. I caught her planting her ‘Australian corner’ that afternoon – eucalyptus trees, as she’s recently found their leaves fantastic for her printed textile work. As it was a lovely afternoon we then went to ‘visit’ her Ash and other broadleaved trees. So it was heartening to see her Ash and other trees doing so well. Not sure what came over Alan but he jumped up on the fence and I snapped this photo above. I couldn’t help but think it was a positive image to think about the many new trees growing in recent years amidst the storms that had rolled across Ireland this winter and caused so much destruction. 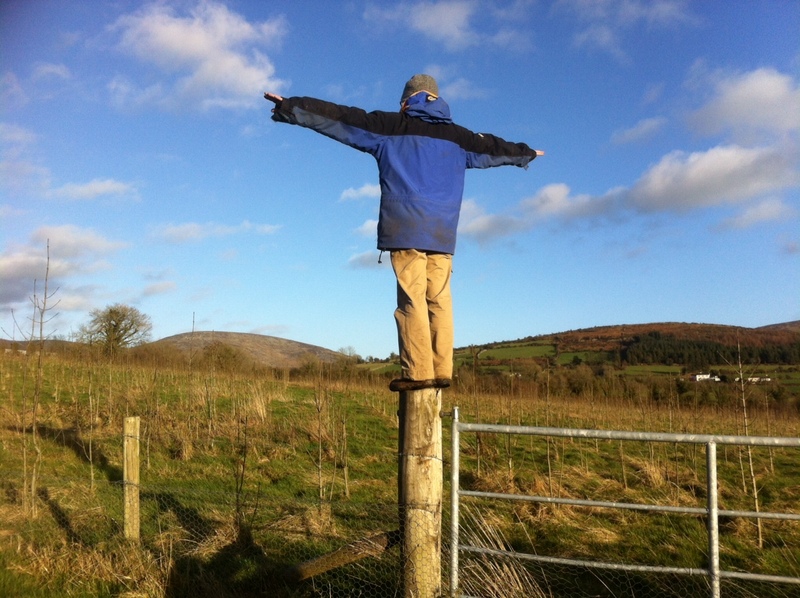 Like the well-known Angel of the North sculpture, here Alan was the ‘angel of the young Ash trees’. The tree-marking workshop I organised to mark the start of the Hollywood forest transformation project. Jan Alexander led the day, May 2008. (Photo: Gwen Wilkinson). Interestingly Nicola is one of a group of 12 local people I invited to my Hollywood project when it first began. To mark the beginning of my Hollywood Diaries project I had asked my friend Jan Alexander (Crann founder and then ProSilva Ireland Chair – the organisation that since 2000 has been promoting non-clearfell Close-to-Nature continuous cover forestry) to lead the day (as we had done a forest film before) and interview the people while I did the filming. Oddly, a day or so back I came across these video interviews I filmed of the people who attended the first day back in May 2008 (it is footage I thought I had lost due to a harddrive failure). Looking at the videos now its fascinating to see how we have all developed our forest interests in different ways. So here is Nicola back in 2008 just before she started planting herself. Nicola was like ourselves in not knowing how to manage a woodland. I had knowledge of broadleaf tree planting from my previous work with Jan and others at the Crann tree organisation but managing a woodland is something else. I remember so many people saying to us to get rid of our conifers, that if we liked trees, just clearfell them and start again. Lucky we didn’t do that, its been so interesting and rewarding on so many levels to learn how to help transform our plantation into a forest. I’ve also added below the interview with Chris Hayes –lightfootforestry.ie, the forester who did a fantastic job of our initial forest transformation work at Hollywood (he and his colleague removed about 25% of our conifers in Jan 2009 using his low impact ‘Iron Horse’). I was very fortunate in having such enthusiastic people around me. Here below is the clip I filmed of Malcolm Noonan, Green councillor for Kilkenny. Looking at it now I was startled to hear Malcolm talk about forest policy as some years later I took on Green Party forest policy work in early 2010. It was a long process to see it adopted fully in 2012 but I had and still get a lot of support from Malcolm regarding forest policy and politics in general. Malcolm is now the Environment, Community and Local Government spokesperson for the Greens while I’ve taken on the role of Forest policy spokesperson. I’ve also had tremendous support from the committee of ProSilva Ireland and its leading foresters and ecologists. Still, its a wonder how many things have emerged from one tiny Wood and its ‘quirky’ forest owner. Hope you enjoy the films! Comments welcome.